I had a total Grease inspired slumber party moment when I took these blog photos at the weekend. I was over the moon when a particular blog package arrived last week because it is not everyday you see your name on a hair dryer. That's right - Jade was neatly displayed on a black, sleek Lanai Blo hair dryer* and I couldn't wait to test it out and write this review for you all. I have said on numerous occasions how hard it is to style my hair, I have naturally frizzy, wavy hair and if I don't dry it with a hairdryer, all hell breaks loose. I thought today would be the perfect opportunity to talk about cutting my hair and how this has made an overall difference to drying my hair. My hair was painfully damaged and thin before I cut it last month and I was in desperate need of a good trim. My hair feels incredibly thick and healthy now but I love how easy it is to style now that the ends are stronger. Your hairdryer certainly plays a big role in how your hair will dry, so it is important to find a hairdryer that will work effectively without causing heat damage. When I first opened the LanaiBLO hairdryer, I was really impressed with how long the cord was. My mirror is on the other side of my bedroom so it can be such a pain to get up close with heated styling tools because the cord usually doesn't reach. For the appearance of the LanaiBLO hairdryer, the classic black design is my idea of heaven. It looks classic, smart and I love that you can personalise the hairdryers with your name - hello, perfect Christmas gift alert! When it came to using the LanaiBLO, I actually tested the hairdryer a few hours before I took these photos and my sister was sitting in my room while I did it. We were both shocked at how fast the LanaiBLO took to completely dry my hair. 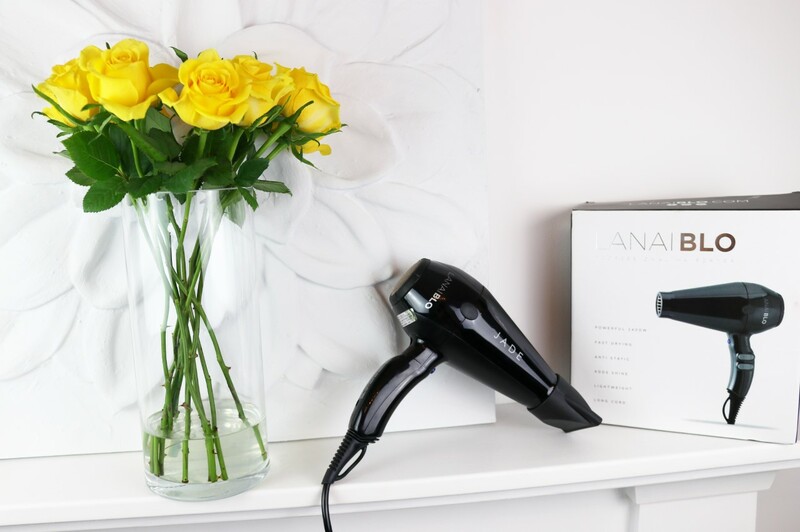 The speed and heat was incredible and I have never had a hair dryer that worked so fast and let's be honest, drying your hair can be a real chore sometimes and I used to avoid drying my hair like the plague but I have actually been looking forward to using the LanaiBLO, I cannot fault how fast this hairdryer works. I love that you can blast your hair with different settings so if you want to create a skilled blowdry, you also have two different nozzles to choose from to create the look you want, or if you want a strong amount of power to give you body and volume - you have this option too. These pictures are SO cute! And that hairdryer looks fabulous.